Project Summary: Critters field guides have been distributed to over 232,000 students in 10 states nationwide through interactive field and classroom programs. The need for conservation education for America’s youth is a broadly held concern. Securing the future of our fish, wildlife and natural resources depends on recruiting and educating a new generation of stewards and outdoor enthusiasts who will invest their time, talent, passion and money in the conservation of the America’s fish and wildlife. Wildlife Forever has an established partnership with Adventure Publications of Cambridge, Minnesota for the development of the Critters Pocket Guide Series. Wildlife Forever underwrites the cost of researching and writing new guides while AP underwrites the costs of layout and design. As a result, local partners are able to obtain and distribute the high-quality youth pocket guides to local students in a very cost-effective manner. The Critters pocket guides profile wildlife and bird species that are native to a particular state. Each species profile contains a color photograph and information on habitat, home range, physical characteristics, and feeding and reproductive behavior. Each species profile also includes a segment titled “Did You Know” highlighting interesting facts such as speed, defense mechanisms, population trends and status. In addition to the 50 species profiles, complete with full-color photographs, Critters pocket guides contain page space to record and list dates, times, places and notes when species are sighted; an eight page glossary of wildlife terms; and a ruler along the back cover to measure length and width of wildlife tracks. The easy-to-use, hands-on format of the guide will foster an interest in wild things and wild places, resulting in greater awareness of and appreciation for wildlife in urban, suburban, and rural areas alike. Government – Minnesota Department of Natural Resources, Arizona Game and Fish Department, Michigan Department of Natural Resources, MassWildlife, Wyoming Game & Fish Department, Illinois Department of Natural Resources, New York Department of Environmental Conservation, Maine Department of Inland Fisheries and Wildlife. NGO’s – Wildlife Forever, Texas Wildlife Association, Indian Creek Nature Center. Private sector – Adventure Publications, San Antonio Livestock Exposition. Foundations – Fred Maytag Foundation, Peter H. & E. Lucille Gaass Kuyper Foundation and the Nadalynn E. Conway Trust. The Critters pocket guides are designed to stimulate independent study of wildlife. The books will spark students’ imagination, and motivate them to learn outside the classroom by exploring the nearby meadow, wetland, or woodland habitats in a particular state. The time spent in nature conducting informal studies will foster a direct relationship with the natural world, as well as respect for the creatures that share it. 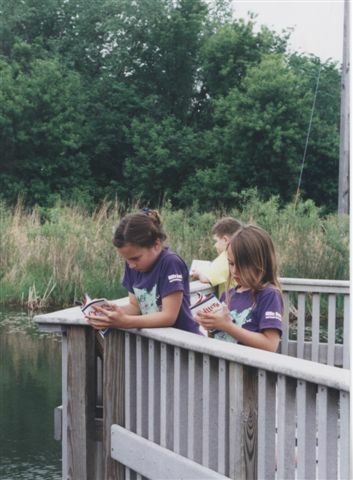 As students use the pocket guide in their backyard or on a family trip, they will share their enthusiasm with family and friends, impacting more individuals with a positive conservation message. A particular strength of the Critters Pocket Guide Series is how it educates entire families and communities through conservation education for kids. As students use their new Critters pocket guides in their backyard or on a family trip, they share their enthusiasm with family and friends, impacting more individuals with the message of conservation.